No one who follows the music industry accuses artists of selling out anymore when they cozy up to corporations – not at a time when an Apple or H&M ad can do more to get a song noticed than Soundcloud ever will. In recent years, a musical elite has turned the notion of corporate sponsorships on its head by becoming corporations themselves. Rihanna’s evolution as a personal style brand is a case in point. In the 19 years since she signed her first recording agreement, with Def Jam Records, Rihanna has become one of the most streamed musicians of all time. Her songs have hit Number One on the Billboard charts 14 times. She is a winner of multiple awards. And she’s done something else as equally impressive, perhaps more so: rewritten the rules for the fashion and beauty industries. Rihanna learned her lesson well. As she racked up song hits and music awards, she gained a reputation for her inventive and daring dress, achieved through collaborations with designers such as Mel Ottenberg. In time, she would add the title of official fashion icon to her list of accolades when the Council of Fashion Designers of America named her Fashion Icon of the Year for 2014. Her first fashion line, Rihanna Designs, a partnership with Emporio Armani Underwear and Armani Jeans. Reb’l Fleur and Rihanna Designs were just the beginning. She went on to create fashion and beauty businesses by creating partnerships with different companies seemingly at will. In 2013, she formed a clothing collection for the British brand River Island. She created even more high-profile ventures, such as successful clothing designs for Puma (where she was named creative director). Her crowning achievement was her Fenty Beauty personal care brand, which focuses on people of color. Fenty, started September 2017, was expected to achieve $570 million in revenue in 2018, according to The Wall Street Journal’s Matthew Dalton. Time magazine would name Fenty one the best inventions of 2017 for being inclusive. The collaboration . . . shows how radically the power of social media has changed high-end fashion. Brands that once counted on acclaim from an elite group of critics and retail buyers now rely on social platforms to market their designs, particularly to younger consumers. That requires fashion houses to court influencers—people with large online followings—or team up with them to generate buzz. She gets much from these relationships – hundreds of millions of dollars and a means to remain relevant independent of the strictures of music. She’s not toured since 2016 when she released her latest album with an innovative distribution deal through Samsung. She can release music and tour whenever she wants because she has freed herself from the music industry. In fact, Rihanna has turned the tables on the music industry: her new album in 2019 will support her fashion interests, not the other way around. Her ventures have given her a chance to change an entire industry by making beauty brands pay attention to the purchasing power of people of color. 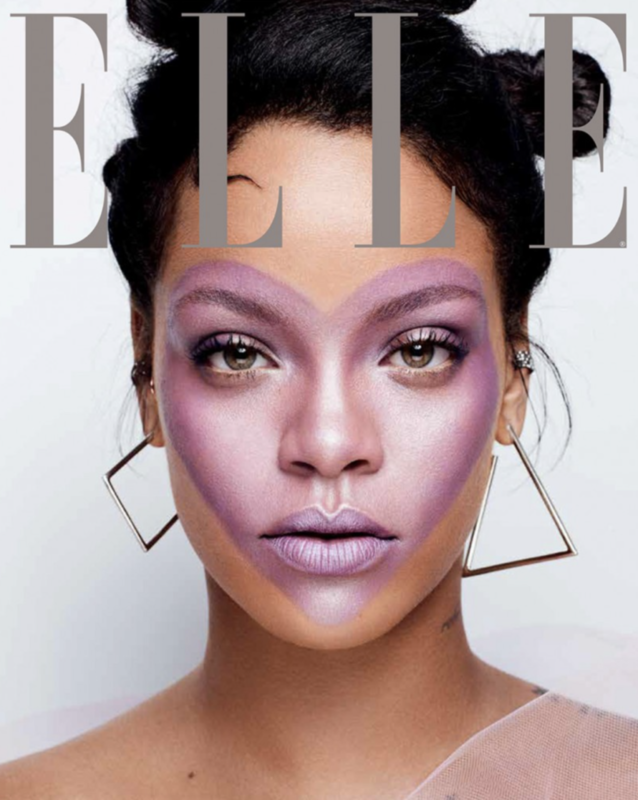 Her Fenty line has been credited with making other personal beauty lines cater to people of color by releasing more foundation shades, an industry shift known as the Fenty Effect. 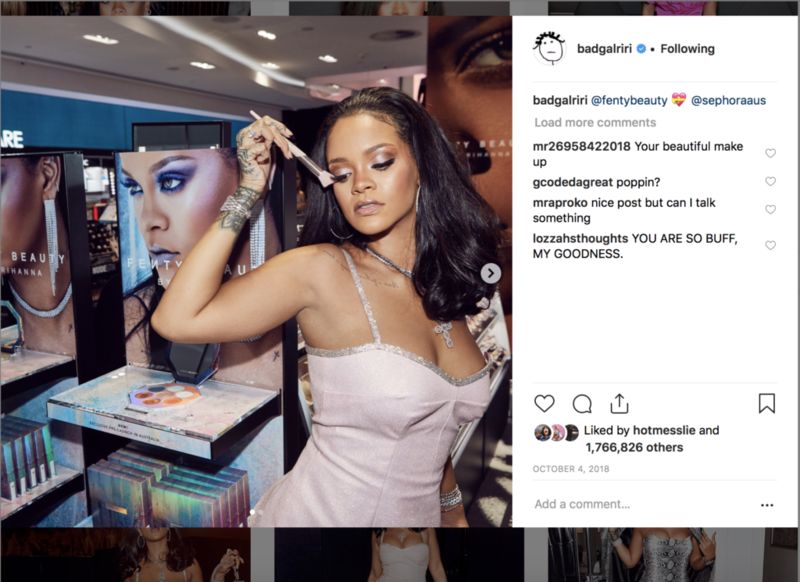 So it’s really no wonder that Fenty’s darker shades sold out practically upon their debut: by providing a richer dark-skin collection, Fenty captured an audience that has been consistently ignored by most of the industry. That said, it wasn’t just Fenty’s products or Rihanna’s celebrity that lead to its success. The brand’s marketing campaign also prominently featured people of color, a move that has now been adopted by mainstream brands as they hop on the 40 shade wagon. CoverFX, for example, actually launched an inclusivity campaign on social media with the hashtag “#NudeIsNotBeige” a week after Fenty’s debut, and in May, when CoverGirl released its 40 shade Matte Made foundation line—its “most inclusive foundation ever!”—it did so with Issa Rae and Ayesha Curry as its Cover Girls. Then there’s Revlon’s new “Flesh” collection, which is literally branded as an “inclusivity-driven” beauty line, and Too Faced—another last minute addition to the party—whose founder, Jerrod Blandino, announced with an Instagram photo featuring black and brown models that he would be teaming up with black Youtube makeup artist Jackie Aina to “develop an even bigger shade range” of the foundations. But Rihanna is beyond accusations of pandering. That’s because she possesses brand authenticity – in other words, her products reflect her actions and statements consistently. Reportedly she turned down the coveted halftime show for Super Bowl LIII, occurring February 3, to support embattled quarterback Colin Kaepernick and because of the NFL’s controversial National Anthem policy that sparked Kaepernick to take a knee during the National Anthem. She has also spoken out against racism in the music industry and generally exhibited inclusivity in her actions and charitable foundations. Rihanna is not the only musician who has become a business mogul. As I wrote in The New Music Moguls, Jay Z operates ventures ranging from entertainment to venture capital. (His company Roc Nation manages Rihanna.) Dr. Dre is worth hundreds of millions of dollars because of his interest in Beats Electronics, sold to Apple in 2014. Many other artists have branched into industries such as fashion and liquor, as I discussed in The New Music Moguls. Few musicians will ever get to this level of success, but the music moguls have defined a new end game. And Rihanna is changing the game. This entry was posted in Music and tagged David Deal, Fenty, Madonna. Bookmark the permalink.